There’s nothing left to be said about videogame companions. They’re terrible, most of the time, and we all know why. Which is why there’s also not much room to praise Elizabeth from Bioshock Infinite. As the game so clearly points out for you, she gets out of the way. You don’t need to take care of her. But the joy from Elizabeth isn’t sourced from the fact she’s a companion that actually can take care of herself. No, she is a fully-formed character. She has hopes and aspirations. She is well-read, and witty. Her voice-acting is impeccable and her animations carefully designed. At some points during this game, I forgot I was dealing with a computer instead of a person. One of the most delightful moments of the game is when Elizabeth finally breaks free of her tower prison, running around outside in the sunshine. She’s entranced by everything she sees, bright eyed and just reveling in the fact she's finally outside. There’s something so magical about this moment. Elizabeth seems so carefree. She isn’t concerned about the forces coming to capture her again, or the massive trouble she’s found herself in. Or the strange man attempting to kidnap her for his own selfish gains. She’s just having fun. I stayed and watched for a while. Why aren’t I playing as Elizabeth right now? 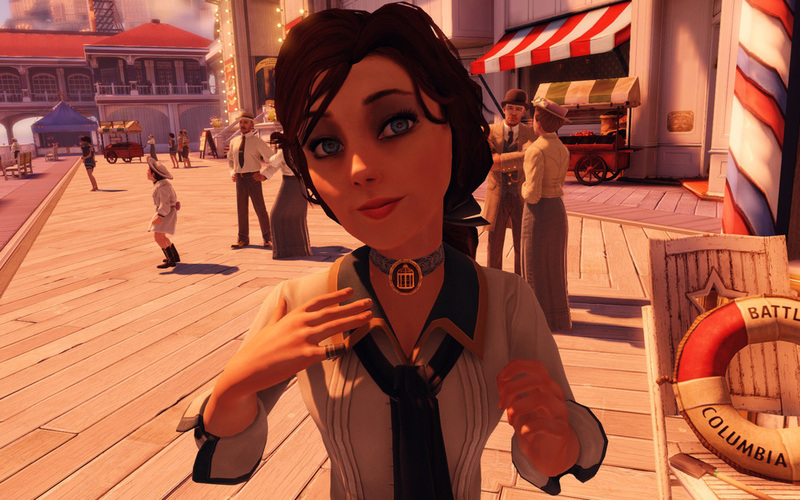 Until this point, Bioshock Infinite hasn’t played with your emotions much. It’s done a great job of putting you in Booker’s shoes, of showing you a wonderfully constructed world. But it’s been fairly placid, apart from a rushed escape and some combat. It’s hyped your adrenaline, sure. But there’s been no tangible, emotional connection between you and anything else. There has been no swell of emotion. So it bothered me I was watching something so wonderful and I wasn’t allowed to participate . Elizabeth looked so happy after finally being free. I was jealous of her. I wanted to experience that same high she was feeling. I suddenly felt angry I was playing the role of a much less interesting character. Let's just put aside for a minute the imagery this would bring about breaking down stereotypes of women in games. That would be an amazing development in and of itself. Part of my argument is connected to the trend we’re beginning to see in promising female characters. I’ve been interested in The Last Of us for a while, and especially since I learned the companion character would be a teenage girl. So I was delighted to see a story over at Kotaku profiling a comic book now available about her back story. To my delight, it looks pretty interesting. Now…why is this in a comic book and not the actual game? Clearly, the writers have spent time developing a rich and interesting story for Ellie. It seems a shame that with such a great opportunity in front of them, Naughty Dog has opted to make the protagonist an adult male. I can understand why, especially if there’s going to be a lot of hand-to-hand combat. But that doesn’t mean the game couldn’t have been built in a way as to encourage the use of a female protagonist. Both of these characters – Ellie and Elizabeth – have good character arcs. There is nothing to suggest they aren’t able to experience the highs and lows of their own stories. Look, it’s no coincidence the two major supporting characters of this year are women. It's not all bad. We've had Lara Croft, a great step forward. But I don't think it's enough. It’s not as if creating these emotional moments isn’t possible. The final scene in Journey is one of the most emotional I’ve ever experienced in a videogame. After your struggle figuring out puzzles, falling through chasms and losing your way with strangers, you finally make your way up a hill that may very well kill you before you get there. Every person I know who’s played that part of the game has felt at least some sort of emotion. Many cried. And that was just in two hours. Now, if I felt that way looking at Elizabeth dancing on a boardwalk, how much more wonderful would it have been if I was able to play as her while that happened? By not allowing us to play as female characters, developers aren't just sending a message that they shouldn't be playable characters at all, they're robbing players of such wonderful emotional stories - and the moments within those stories. Booker's never been trapped in a tower. Booker's never been told he can't use his power. Booker has never been kept from the outside world. In either of his scenarios, he's had complete control over his destiny. Elizabeth has never had any such thing. Maybe Elizabeth works better as an NPC. I actually think she’s perhaps the best companion videogames have ever seen. (Although, there’s something to be said about the idea a player could fulfil the shoes of a secondary character instead of a protagonist. But I’ll leave that to another time). But the principle remains. By playing as Booker, rather than Elizabeth, the game may have you given you a great story, but it’s potentially robbed you of some of the most emotional moments in gaming so far. He's a good character, yes. He's just the least interesting one. Let’s not be pessimistic about this. The fact Elizabeth is a well-written, well-voiced character with agency is a great step forward, at least, in my view. I don’t claim to speak for anyone else. But I just can’t help feeling a heavy sense of envy. Irrational has created such a well-formed, brilliant character, with a tragic past and a fully-formed character arc. Why won’t it let me walk in her shoes?